Sponsored content listings below the article "FROM AROUND THE WEB... 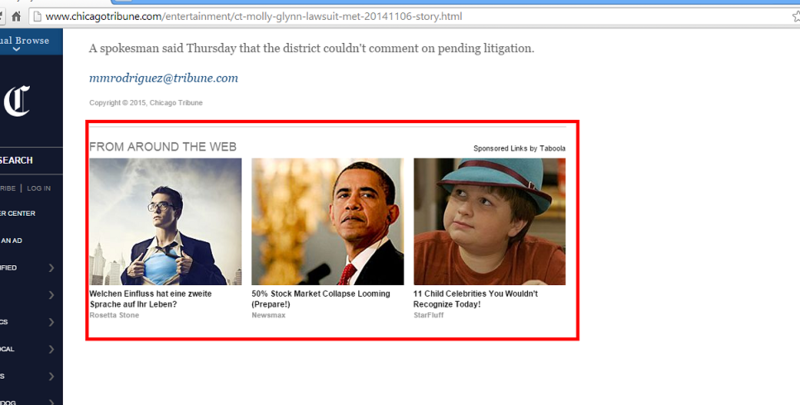 Sponsored Links by Taboola"
Taboola is on the default WHITELIST for adblock now? This is literally insane. I now understand why I kept seeing this garbage again. Am turning off all whitelisted ads now and advising friends to do so as well. This is like some kind of sick joke by adblock. Hope you got paid a lot for this, because it just cost you a lot of credibility, and I've turned "Allow some non-intrusive advertising" to NO. This is lousy and now I'm fully opting out of the "acceptable ads" list. It's a shame that Adblock Plus is becoming a shill for newest worst offenders. Like the Church of Scientology buying the "Cult Awareness Network." Acceptable Ads have nothing to do with any EasyList. The whitelist is supposed to be for non-intrusive ads and a massive block of basically fake related links slapped at bottom of every article is AFAIC the very definition of intrusive. Matchstick wrote: The whitelist is supposed to be for non-intrusive ads and a massive block of basically fake related links slapped at bottom of every article is AFAIC the very definition of intrusive. Please always refer to the part of the criteria which you think they're violating. However, if you think that the criteria should be changed or something should be added there then please create a new topic in the Accceptable Ads discussion forum. "Preferably text only, no attention-grabbing images"
You really sold out here... Read an article on arstechnica which mentioned this and I honestly thought it was a mistake. Taboola ads are the opposite of acceptable in my eyes. Allow non-intrusive advertising is permanently turned off while the likes of taboola are whitelisted. So far Taboola has proven to be very cooperative to immensely change the positioning of their ads, their labeling, their separation from the content, their sizes and their grouping in order to qualify for Acceptable Ads. If you turn on and of ABP you will see the improvement of their ads. I'll stick with disallowing non-intrusive advertising. Regardless of its placement it's junk content and imagery, gutter ads, just cheap distracting click-bait usually unrelated to the content of the website you're browsing. I dislike Taboola's style to the point that I set up a DNS adblocker to remove it from mobile devices at home... I don't intend to start allowing it through on my main PC.